Eva Hašková, a graphic and an illustrator was born on January 4, 1946, in Kladno. In 1974 she graduated from the College of Applied Arts under professor Zdeněk Sklenář. She devotes herself to free graphic and illustration. 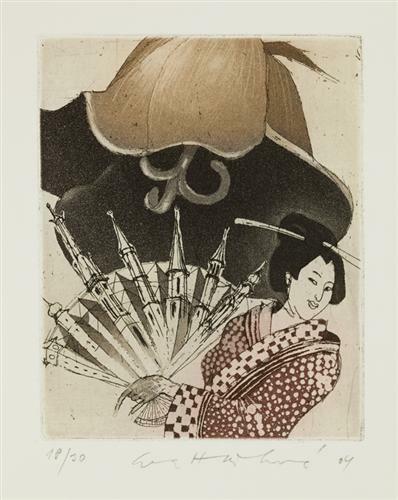 She mainly creates using intaglio combined technique - etching and aquatint. Pale, not bright colours are a strong artistic media serving as a means to reach a brilliant aesthetic effect. Even her graduation artwork from 1974, illustration of Nezval´s Valérie a týden divů (Valery and a Week of Wonders), created by combined technique, draw the attention of editors of graphic and bibliophile prints in Lyra Pragensis, and so in 1976 there she first presented her charming illustrations to a wider audience of collectors and bibliophilists. She is a member of SČUG Hollar. Today Eva has created tens of graphic lists of small and bigger format and has illustrated a number of books for children. Her artwork is accepted with great interest and admiration and that is also the reason why she has been awarded a lot of prizes so far: in 1976 she was given the Prize of Arno Sáňka for the most beautiful book of the year, in 1979 a prize of the Ministery of Culture, at IX. Biennial of Applied Graphic in Brno in 1980 (i.e. an international exhibition of illustration and book graphic) she was awarded a prize of the Vyšehrad Publishers for the presented cycle of illustrations and IBA Leipzig commendation for free graphic in literature. In 1996, 1999, 2000 and 2002 she was commendated by VIII. And IX. Triennial of Czech ex-libris in Chrudim and in Prague. Graphic lists of Eva Hašková surprise by the richness of tones, often a colour scale, but always by an interesting and original composition. Her favourite colours are brown and green, sometimes even the combination of blue and violet. A lot of her artwork follow the decorative treasure of art nouveau by its overall composition and by a number of plant motifs.